Wow, Mimi! You are off to a great start! Lookin' good! Thanks, sanderson, for checking up on me. All is well. just had my annual checkup and I am good for a few more years yet. to Kolsen from Kelown, BC and Shargets Healthy from Victoria BC. Ir seems to me that all the SFG gardeners live in British Columbia and Ontario with the odd one scattered around. Does no one SFG on the Prairies etc? I must do a census and see where we al are. My garden is somewhat behind this year but I can boast of a very tall thistle, about three feet, that I managed to dig up at great cost of being prickled in spite of the gloves I was wearing. That will teach me to get out there weeding while everything is tiny. I say this every year but I admit to being a champion procrastinator. @Kelejan wrote: Thanks, sanderson, for checking up on me. All is well. just had my annual checkup and I am good for a few more years yet. Great to hear that you are well. As always I get concerned when we don't hear from you for a few days. Thank you, TD. It sure gives me a warm feeling. This Forum to me is one of the stars of the Internet. Anyway, guess what? It is raining again and forecast for at least the next three days. My wood chips have never had it so good. @Kelejan wrote: Thank you, TD. It sure gives me a warm feeling. This Forum to me is one of the stars of the Internet. Raining forecast here too, but I don't mind...and the strawberries will be happy I think. The Hey all! Can't believe June is halfway through! Small update on my end - I pulled up my butterhead lettuce plants that I had been harvesting leaves from, as they were starting to get bitter. I planted mixed wildflower seeds that I got free from a festival a couple of weekends ago in the shallow tier where a bunch of my lettuce used to be, and moved one of my container eggplant plants into the spot where the other lettuce used to be in the main SFG. A couple of my other eggplants have started flowering, one with a full blossom. A couple of my bush tomatoes have also flowered as of a week or so ago. Corn is doing well also. The biggest ones are approaching 4 feet tall. 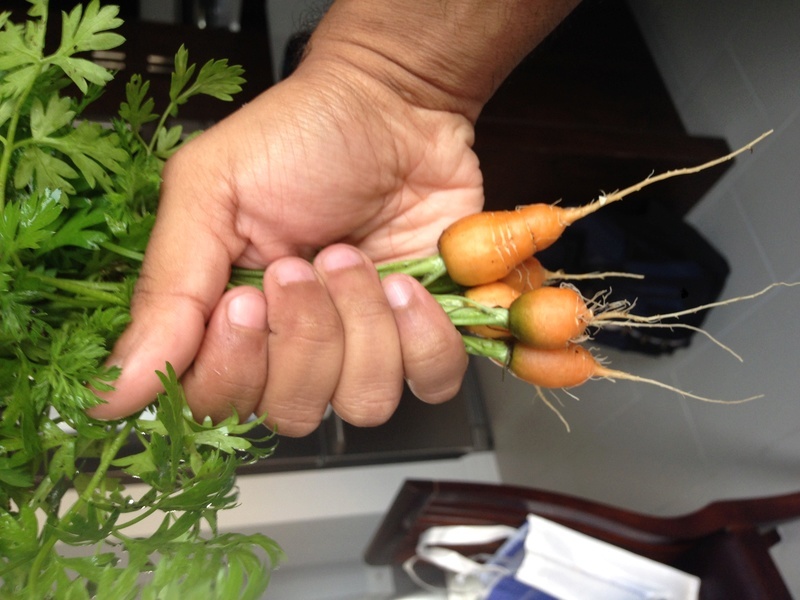 Lastly, I pulled up some of the round Romeo baby carrots that were growing in one of my tomatoes containers. They were smaller than they could have been but I started them indoors and then moved them out so I think they didn't have the most optimal conditions from the get-go. Still tasty though! I planted the same baby carrots directly into the garden for carrot week so we'll see how those compare. Here are a couple of pics. I'll take pics of the garden early this week and post them also! Those carrots do look tasty, Fiz. I picked some strawberries this afternoon but some of them had gone mouldy, probably because I did not weed the bed as I should have done so the continual rain had lots of places to remain. My grass is getting ever higher as the person who should have come to look at it has not yet turned up. As it is a senior volunteer I will not complain, but a kind neighbour is coming over tomorrow, Monday, with his gas mower and will be doing the major cut. I can trim the edges when I figure out how to insert the plastic line into my weed whacker or trimmer or whatever we call it. Birthday lunch tomorrow for one of my friends of the group who celebrate each birthday during the year. Sad to say only four out of six of us left. We used to have three cars between us but the two who have gone were car drivers. I can drive but no longer have a car. Fiz, Congrats on the carrots. Sometimes undersized carrots can be so tasty. KJ, You're a better woman than I if you now how to use a string type weed whacker. My husband usually does that duty, but one time I thought I could do a better job. I gave up after 10 minutes. 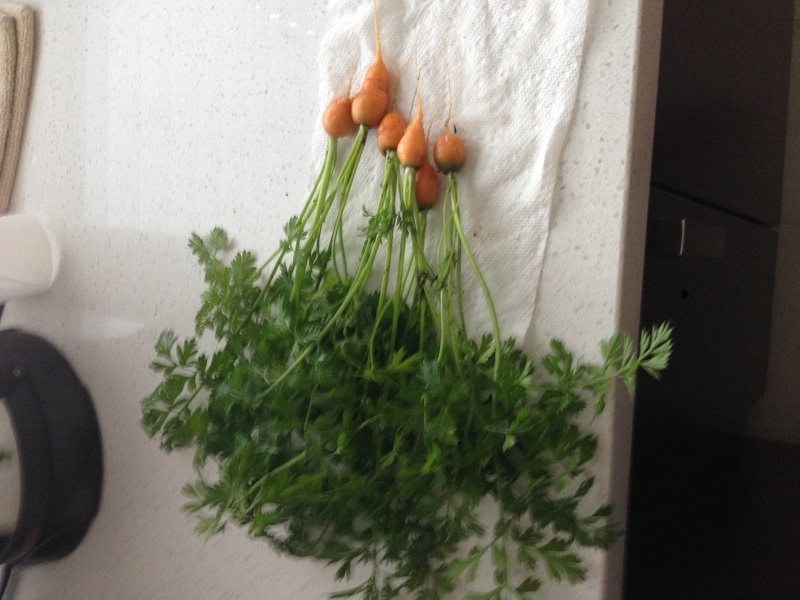 OK, you guys, confession: i did a terrrible job of thinning my carrots.....so, they will do badly. @Scorpio Rising wrote: OK, you guys, confession: i did a terrrible job of thinning my carrots.....so, they will do badly. Same here. Now I'm on a guilt trip cuz they came through for me in spite of my poor performance. From now on I promise to be a much better carrot farmer. Scorpio and countrynaturals: please do not allow carrots to have you on a guilt trip. I don't think they have any feelings. I know you will do better next time. My lawn is looking smarter after today's efforts. I used my oversized rake to gather up all the heavy clumps of grass that had been left behind by my neighbour's valiant efforts to cut my overgrown grass that was still very wet yesterday. He will be coming again to give it another going over as we have sunshine forecast for the next few day and later on it will be going up into the mid 30Cs which is far too hot for garden work. We will have to start watering soon. My string trimmer is working beautifully and I was so glad that I was able to re-string it when it had run out of line. No word on anyone coming to fix my lawn mower. I looked up my model on the Internet and realised that I had probably over taxed it as it was only an entry level machine, all I could afford at the the time, and really I should not have tried to cut the long grass. So, I will go shopping for another better quality model. It is about time I treated myself to tools that are easier for me to manage so that I can continue to garden for a while longer. I found one on the Internet that seemed ideal for me, a battery-operated model, until I read that it was fine on the level but pushing 62 pounds up a slope would be beyond me. Sigh! Also batteries, according to the comments, do not seem to last more than a couple of years before they lose their charge and another one has to be purchased. I have quite an area of flat grass, but getting the machine from that down to the roadside grass and then back up to put the machine away, would tax me somewhat. Tomorrow is the dreaded Garbage Day and I am hoping that there will be no bears around to create havoc. The last four days I have had three bears, a small brown, and a medium black and another medium brown cross my garden. I saw my next-door neighbour this morning and I told him about the bears and that they had been into his garage and up his path to where the kitchen door is and he was concerned. I have arranged to phone him when I see the bears around. I have never seen so many bears at this time of year since I moved into this house in 1996. Did you know that this year, Canada will have two longest days? This is due to the great width of the county so East and West will each have its own day. I expect this will also apply to the U.S.A. 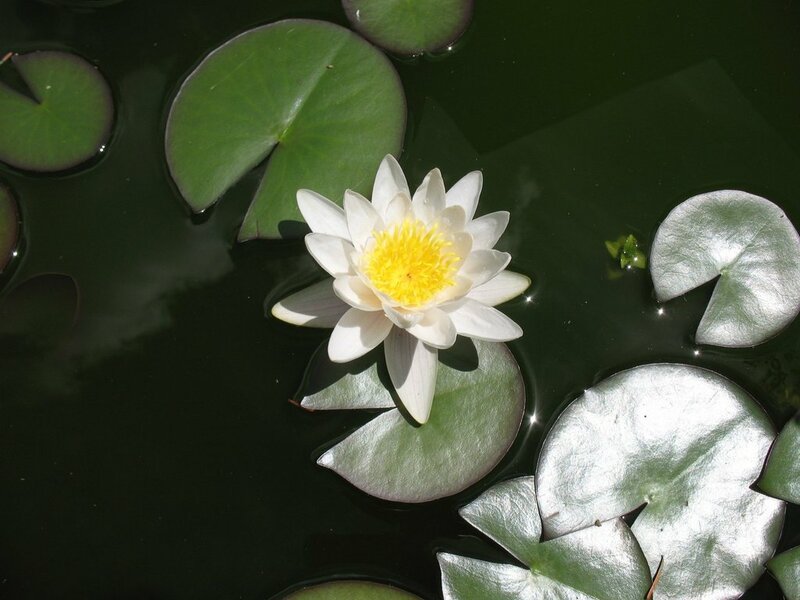 Nothing to do with SFG but I thought I would show off this water lily flower growing in our small goldfish pond. Garbage Day and NO bears. Perhaps my neighbours have learned their lesson as they have not been away and their garbage can was on the roadside. I have a lovely display of delphiniums (larkspur). They are at the far edge of my garden so my neighbours gets the full benefit of them and when they fade away they will have the hollyhocks to look at. This morning I did my daily watering of the potted plants outside my friend's place and each week I am taking a picture of their progress so that she can see what she is missing. Last year she was away for over three months and by the time she came back they had all finished flowering. Hello all... sorry for my absence but baseball season is upon us, and my son plays several times a week. Add onto that my daughter being sick, and now I've caught the bug (so I'm having a sick day and catching up on a few things between naps). Nice to see harvests are coming in. I lost all of my brussels sprouts to caterpillars, but most everything else is coming in strong. My peas are flowering, and I have a few green tomatoes and peppers starting up. I even had my very first harvest this week... some lettuce and baby spinach. The kids were quite impressed and claimed they tasted "greener" than grocery produce. I'm hoping that's a good thing. @Jaffa55 wrote: Hello all... sorry for my absence but baseball season is upon us, and my son plays several times a week. Add onto that my daughter being sick, and now I've caught the bug (so I'm having a sick day and catching up on a few things between naps). Hi Jaffa. Sounds like your SFG is doing well. I was in your area this past weekend visiting the Halton County Radial Railway Museum with our daughter and family. Get well soon. Nice to see harvests are coming in. I lost all of my brussel sprouts to caterpillars, but most everything else is coming in strong. My peas are flowering, and I have a few green tomatoes and peppers starting up. I even had my very first harvest this week... some lettuce and baby spinach. The kids were quite impressed and claimed they tasted "greener" than grocery produce. I'm hoping that's a good thing. Now that is something kids appreciate when they know from where their greens come. @Kelejan wrote: Did you know that this year, Canada will have two longest days? This is due to the great width of the county so East and West will each have its own day. Yay! Summer Solstice is my favorite day!!!!! Greener! I love it! One of the reasons I love gardening is for the taste. I get the feeling that kids with their sharp taste buds "get it" even better than we do. I agree with you, Mimi. I think that is why we complain that things do not taste as good as we remember, for the simple reason our taste buds are getting worn out. On another subject: we had a windstorm come through our area, it was quite frightening as I expected some trees to be blown down. I am always thankful recently that I had my dying beech trees cut down as I am convinced there would have been several occasions when a great deal of damaged could had happened as I knew that the trees could have fallen on my house and also on my neighbour's house, and possibly on passersby in the street. Ten minutes later not a leaf moved on the trees and shrubs and the sun blazed down once more and all was calm. I was listening to a podcast a month or so ago, and they were talking about food, and how the North American palette generally prefers a sweeter taste. As a result, many varieties of produce aimed for the supermarket have gradually become sweeter and less nutritious, and at the same time, less flavourful (they specifically mentioned iceberg lettuce and apples). So, yes, we're losing our tastebuds, but some of the food actually doesn't have as much flavour. This morning I made a steel cut oats breakfast for Mrs TD and myself. I usually use the quick rolled oats but the steel cut are supposedly better. Of course it took muich longer (about 45 minutes) to do up the steel cut oats. But I have three servings leftover for future days. We topped the oats with blueberries and sliced bananas. It's a gorgeous day in Ottawa. The high temp is expected to be 75F (love it!). I'll be happy if I get just a few of those items completed. The rest will still be there for another day. However, the rains are returning this evening which will put a damper on things for Friday. - 90 minutes later and I only have Job #1 completed. 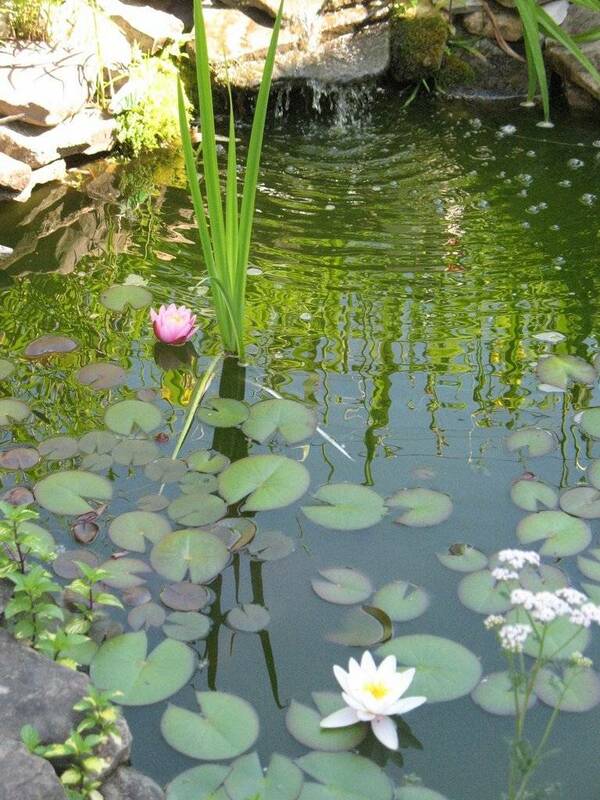 Today's garden pond photos. 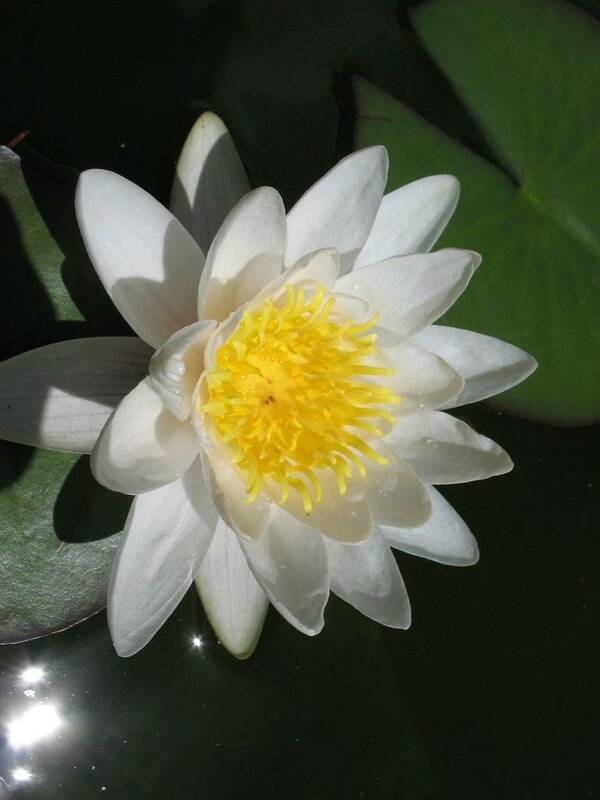 We have a new water lily blooming. This one is pink. 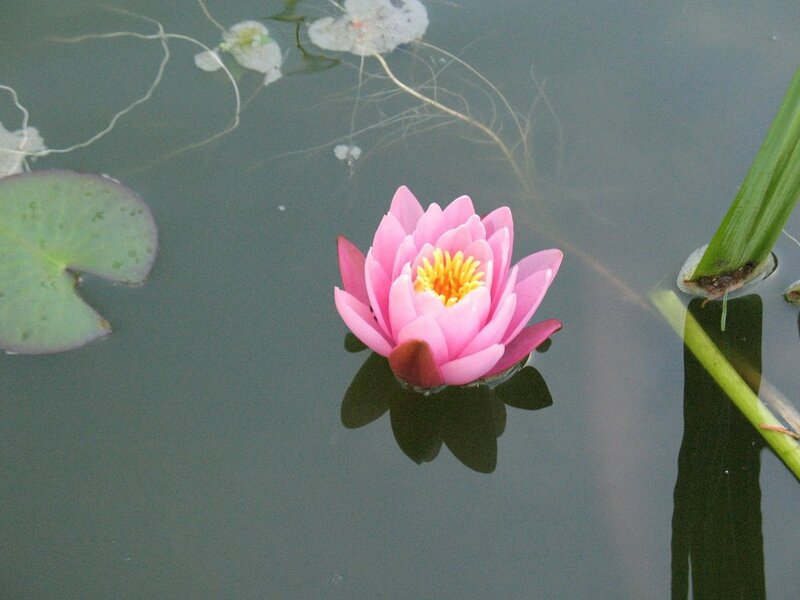 This view show both water lily flowers.